The Kansas Board of Regents is expected to approve a new weapons policy at its meeting Wednesday. A survey done by the Docking Institute at Fort Hays State University showed that 70 percent want legislators to change the law so that guns are kept out of campus buildings. Eighty-two percent said they would feel less safe if students were allowed to carry concealed guns to class. The Docking Institute says it emailed 20,151 faculty and staff at all of the Regent's schools. About half responded. Overall, 70 percent of respondents said allowing guns on campus would negatively impact their course and how they teach; 20 percent disagreed. 66 percent said that allowing guns in the classroom would limit their academic freedom to teach the material and engage with students in a way that optimizes learning, while 24 percent disagreed. 46 percent believe that allowing concealed carry on campus would increase crime on campus, 16 percent thought it would cut down on crime, 22 percent said it would not affect campus crime, and 16 percent said they did not know. The law allows schools to only prohibit guns in buildings secured with metal detectors and guards. But that would be very expensive. Still, 54 percent of those in the survey said they would favor schools spending the money to provide those security measures. It's clear most want the law changed. But it’s highly unlikely the current legislature is going to backtrack — so officials at Regent schools have been working on which of the 800 buildings on the six campuses will have that kind of security. 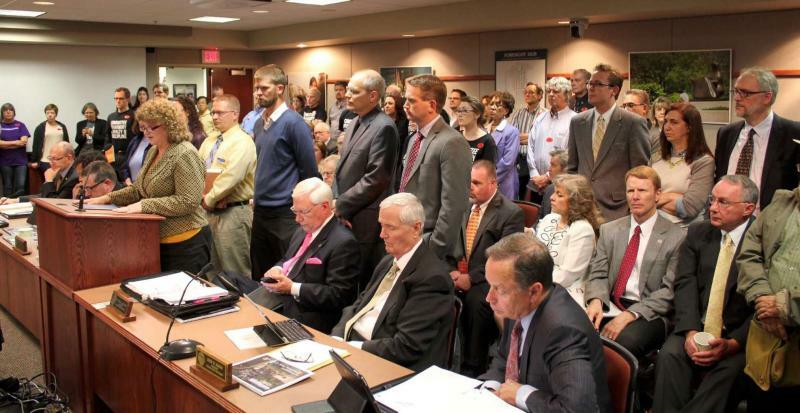 The Kansas Board of Regents on Wednesday finalized a controversial social media policy that places broad limits on employees and is being criticized as one of the most restrictive in the country. Regents Chairman Fred Logan, speaking to a packed meeting in Topeka, defended the policy, claiming it will shore up academic freedom by creating more specific guidelines.